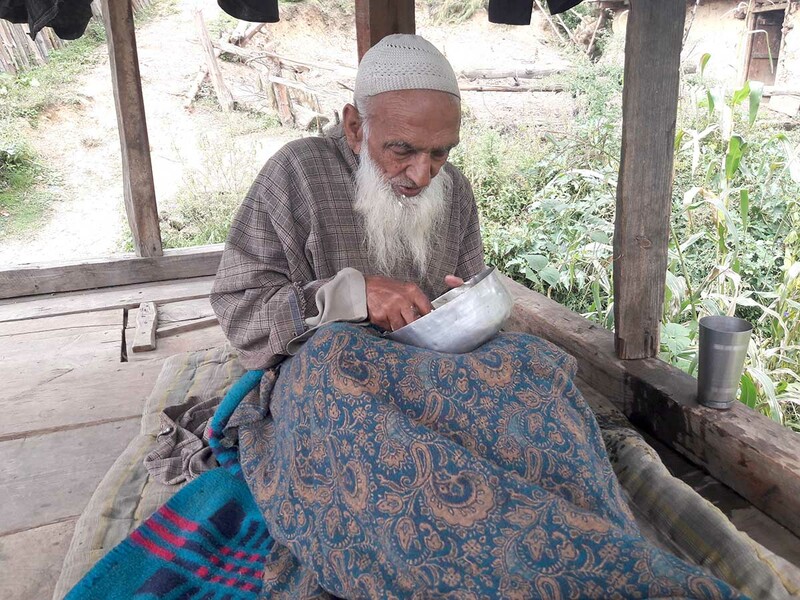 A professional shepherd, Khan lives in a single storey mud house on the summit of a mountain in Brimmer-Nurser in south Kashmir’s Shangus belt. He is always surrounded by his three generations in the Gujjar Basti, located slightly away from the main village. Incoherent and weak in his memory, Khan, however, remembers certain things. In 1945, for instance, Lassa said, he was married to Tooti Begum of nearby village Ranipora. At that time, Jammu used to be the second home for all Kashmir’s cattle herders during winters. “After I got married to Tooti, I stopped going outside,” Lassa said. Khan’s routine was Pulhood, (a grass slipper) for decades during winters. In summers, he said, he used to walk barefoot. “Many times I travelled to Jammu barefooted,” he said. One thing which is very interesting about Khan is that he has never travelled by any mode of transport till he turned 90. Later, due to the old age and weakness his son Sooba used to take Khan in a private vehicle to see a doctor or to a relative or acquaintances, occasionally. Khan also remembers how during the reign of Maharaja Hari Singh, his government would send the residents to Beagaar, the forced labour. Muslims used to plead with the Pandit’s – who mostly were running the government, to release them from Beagaari and ultimately Pandit’s held all the rice-fields of Muslims in lieu of this concession.